1) Account Number: Please note, this is where your Shelby Energy account number is located. 2) Kilowatt hours: This sections shows the amount of kilowatt hours that you have used for the current month's billing cycle. 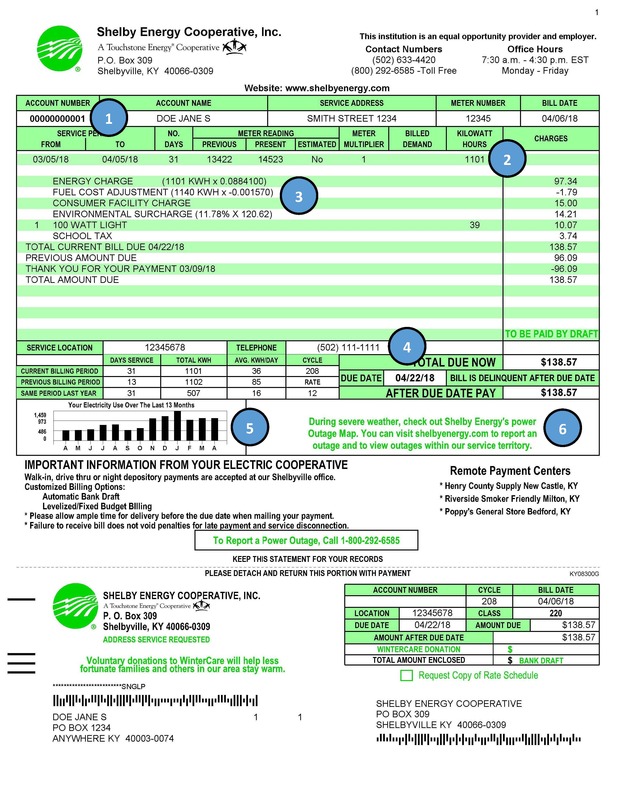 - Energy Charge: Your bill contains details explaining how your energy usage cost is calculated. - Fuel Cost Adjustment: This is used to recover a portion of the cost of coal and natural gas needed to run the power plant that produces the power we use. It is the cost to buy power from other utilities to service our members more efficiently. - Consumer facility charge: This is the minimum bill charge that each member pays monthly to cover a small portion of the costs for Shelby Energy to provide electric service. This would be the members bill amount with no energy usage. -Environmental surcharge: This reflects the cost of equipment and other expenses our power supplier incurs as it complies with EPA regulations on power plant emissions. 4) Telephone number: This is the telephone number that Shelby Energy has on file for your account. Please review your bill each month to make sure all personal information is correct. 5) 13-month electricity usage: This section shows our members a 13-month history of their energy usage. It can help you review trends and evaluate the amount of energy members are using during specific times of the year. 6) Important bill message: Please make sure to read and pay attention to this message each month. It contains event, program, and other general information that is important to our members. Visit Billing Services to see all of your billing options or call 800-292-6585 for more information on easy payment options and understanding your bill.